Veritext in Los Angeles is the regional headquarters and production hub for the West Coast and is conveniently located in the AON Building in the heart of downtown LA. When visiting our deposition center, you will have access to state-of-the-art technology and our signature superior services, including the highest quality court reporting, videoconferencing, audio-conferencing, videography, native evidence capture, paperless depositions and remote deposition services. 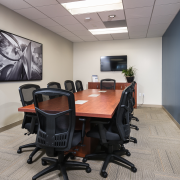 Our Los Angeles office offers fully-appointed deposition suites complete with copy and scanning services, free WiFi, complimentary lunch, an open refreshment and snack area, a coffee bar, as well as a handy copier and fax nook. Our Los Angeles court reporters are highly experienced and provide interactive realtime and deposition text streaming. Veritext legal videographers are equipped with the latest broadcast-quality video cameras and production technology, ensuring quality every step of the way. Interpreters, closed captioning and customized transcription services are also available at our Los Angeles office. The Griffith Observatory Arbitration Suite is a spacious accommodation for any arbitration, hearing, trial or multi-party case and seats 15 occupants. In addition to our pool of highly qualified court reporters, we also have official court-certified reporters versed in reporting hearings, motions and trials. These court reporters have an average of 20 years experience in the local Superior Courts, knowledge of local judges, and are supported by a team dedicated to appeals, and an appointed calendaring clerk specifically for court work. 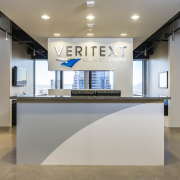 At Veritext, we take data security seriously and like all of our Veritext court reporting offices, our Los Angeles office is HIPAA, PII and SSAE 16 certified. Read more on our Security measures. Our Los Angeles court reporting office is also versed in managing complex cases that cover all areas of litigation, including securities litigation, intellectual property, pharmaceutical, environmental, commercial litigation, negligence, bankruptcy, employment law, antitrust and insurance cases. We’ve been the trusted court reporting company for many multi-party cases. The Aon Building houses a parking garage with valet parking.